Posted November 8, 2018 by Nicholas Cain & filed under Restorative Dentistry. What Causes Advanced Tooth Loss? Why do we lose our teeth? A variety of factors could be the cause, such as accidents and injuries, or untreated decay and infections. However, the most common cause is periodontal disease. Without treatment, gum disease could reach the advanced stage, known as periodontitis. During this stage, the connective tissue between the teeth and gums dissolves, leading to missing teeth. According to studies by the American Association of Oral and Maxillofacial Surgeons, by age 74 over 26% of people in the United States suffer total tooth loss. For patients with multiple lost teeth spread out across the arch, we may prescribe a partial. 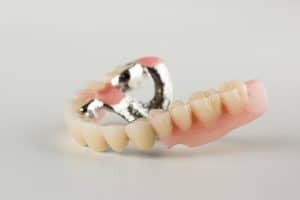 The prosthetic contains a base made from acrylic to look like gum tissue, and metal clasps that attach to natural teeth and anchor the new ones in place. The replacement teeth will be created using lifelike ceramic. If a patient loses all of the teeth on one or both arches, then we may place a complete denture. Again, we create a base made from acrylic. There will be a full set of replacement teeth and natural suction will hold the prosthetic in place. When you receive a prosthetic, you restore your ability to speak clearly and eat a greater variety of foods. Addressing tooth loss also improves your overall oral health and quality of life. If you have any questions about replacing lost teeth, or about our dentures, then contact our team today. Don’t let advanced tooth loss harm your oral health, talk to our team about replacement options. To schedule an appointment with your dentist, contact Healthy Smiles in Gary, IN, by calling 219-938-2637, or by emailing our office at info@healthysmilesnwi.com. We also proudly serve the residents of Gary, Miller, Miller Beach, and all surrounding communities.